Mercedes has unwrapped a new version of its 5.1-metre long GL-Class SUV here at the 2012 New York International Auto Show. It brings a host of new electronic assistance systems and the inevitable round of increased efficiency claims — helped by a 100kg reduction in weight. Mercedes has unwrapped a new version of its 5.1-metre long GL-Class SUV here at the 2012 New York International Auto Show. It brings a host of new electronic assistance systems and the inevitable round of increased efficiency claims — helped by a 100kg reduction in weight. 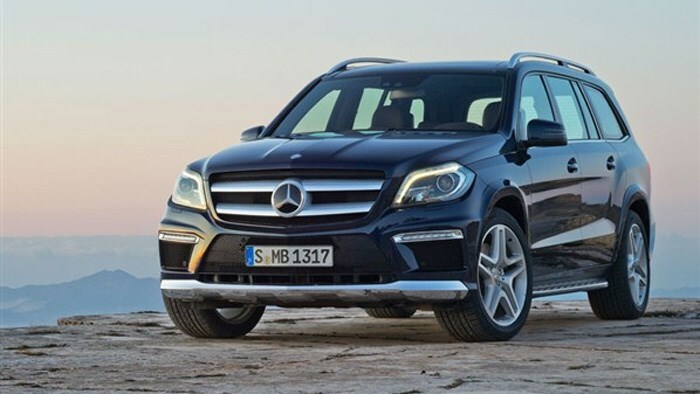 Mercedes describes the new GL as a 'new interpretation of the first generation', which gives you a clue. In fact, as far as we can tell the visual changes are limited to new lights — with the usual LED updates - and some extra chrome for the under-body protection. There's a choice of two engines — a 190kW 3.0-litre V6 turbodiesel badged GL350 BlueTec, and a 300kW 4.7-litre V8 badged GL500 BlueEfficiency. The diesel is not only massively more powerful than the 155kW model it replaces, but also up to 20 per cent more efficient, too. The GL350 completes 0-100km/h in 7.9 seconds — impressive for an SUV that's 5.1 metres long, 2.1 metres wide and 1.85 metres tall. Especially when it also claims 6.2L/100km and CO2 emissions as low as 192g/km. However, the GL500 is two seconds faster from 0-100km/h, making the sprint in 5.9. Top speed is 220km/h for the diesel, and an electronically limited 250km/h for the petrol.